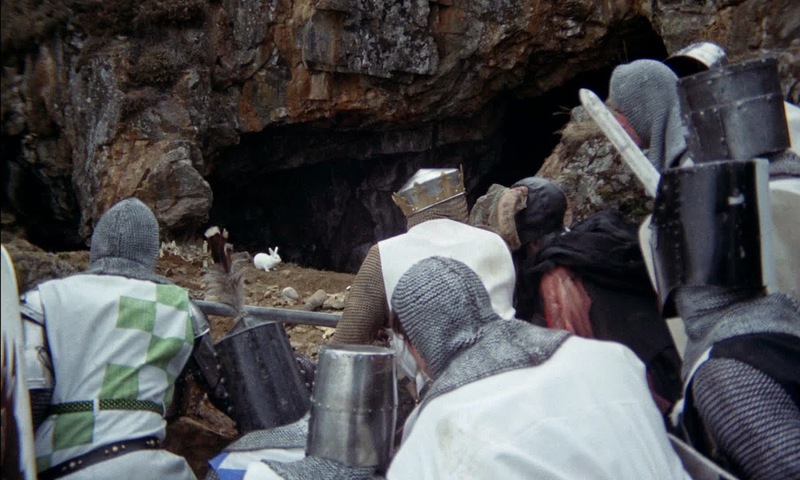 Iconic bunny scenes in faux-Arthurian legend. King Arthur and his loyal squire Patsy ride through Britain in search of worthy knights to join him at Camelot. The low-budget is immediately apparent from the lose interpretation of "ride;" Arthur mimes a steed while Patsy bangs coconuts together to produce the sound of clomping hooves. 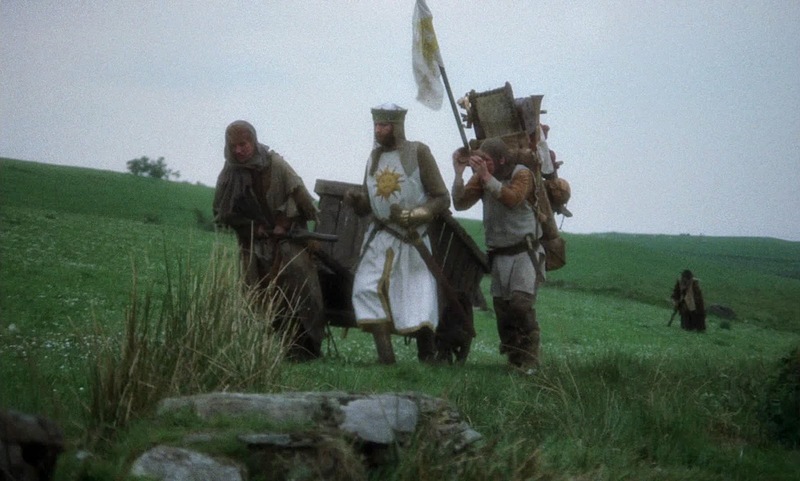 This fits in with Arthur's dubious authority, quickly undermined during his first encounter: a mud-wallowing peasant-dentist who demonstrates a dismaying degree of wit and contrariness in an impromptu political debate deconstructing the backwardness of monarchal rule by divine right. 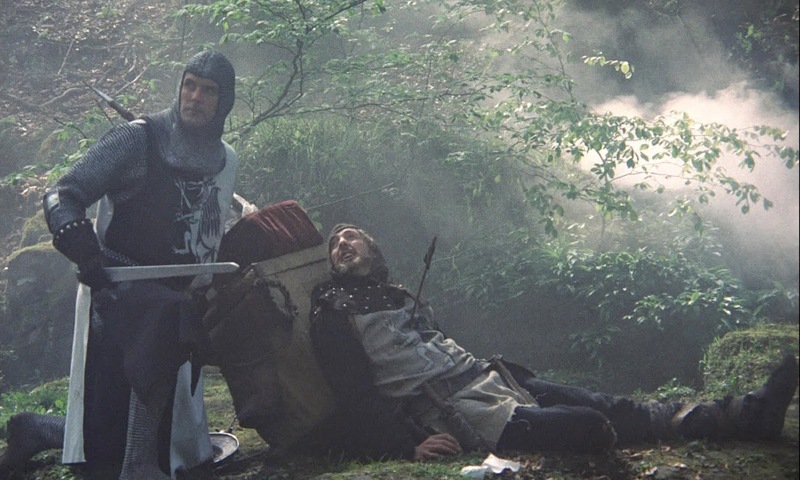 Embarrassed, if to proud to admit outright defeat, Arthur moves on to assemble key members of the Knights of the Round Table such as Sir Bedevere, Lancelot, Robin and Galahad before receiving a quest from God to seek the Holy Grail. 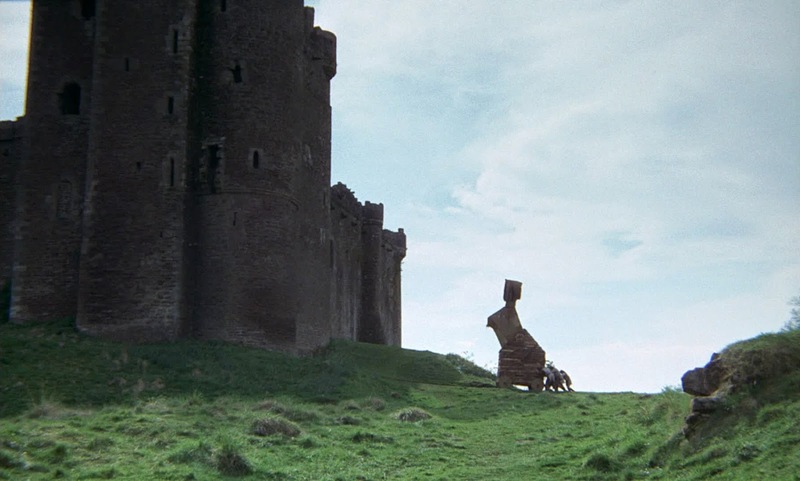 They come across a castle where they are ruthlessly taunted by a Frenchman with a ridiculous accent who claims his master already has a "vice nice" grail and, after a failed siege involving a Trojan Rabbit, our knights split up to cover more ground. 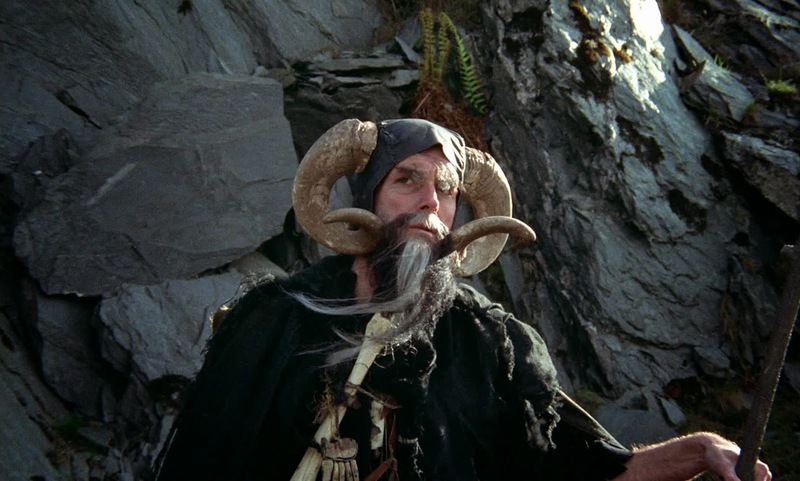 Their further adventures include the botched rescue of an effeminate prince-in-distress, bizarre shrubbery-loving druid knights averse to the word 'it', a castle full of virgins who lure in men using a grail-shaped beacon, an enchanter named... Tim, a shockingly vicious rabbit that can only be destroyed with the Holy Hand Grenade of Antioch, a riddle-spinning bridge-keeper and, finally, one of the funniest anticlimaxes to ever grace the screen. 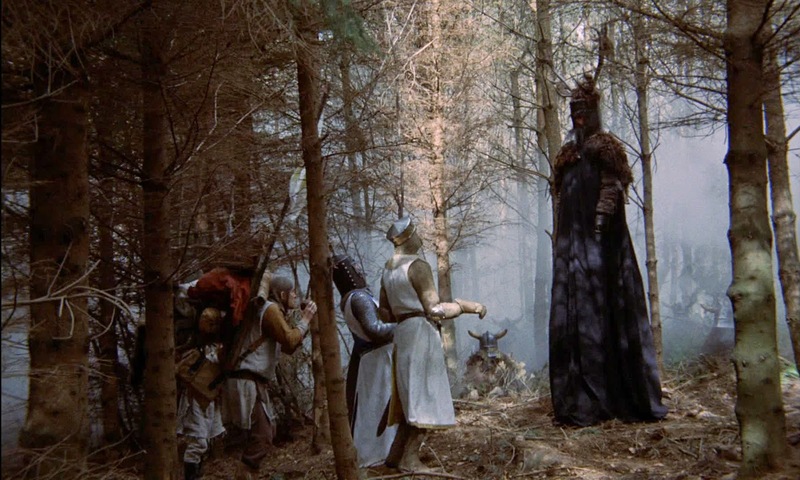 The Monty Python comedy troupe was hot off the success of their multi-season television show, as evidenced by their finely-honed comic tone and timing, but it wasn't a safe bet that their skit-based comedy routines would translate well into a feature-length narrative film, especially one satirizing such a long-shot topic as medieval British legends. 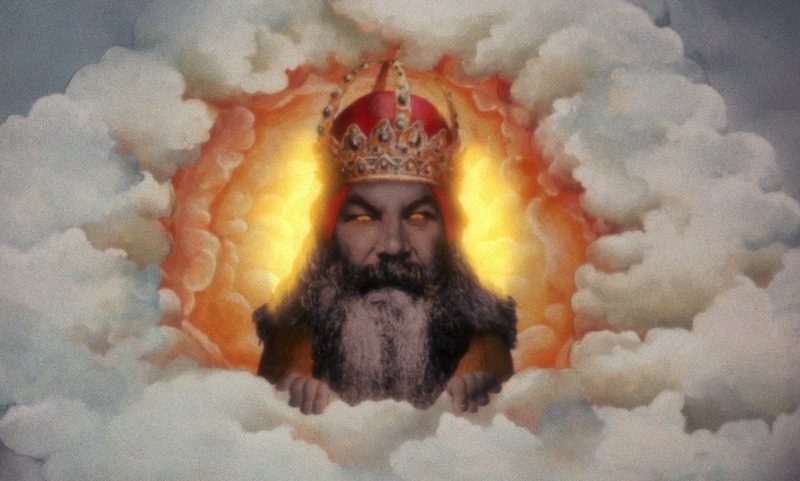 But part of Monty Python's brilliance is their unexpected sources of humor and unpredictable absurdities that stick to an overarching theme without getting lost in the details (except for comedic effect). Such stern topics as witchcraft trials, duels to the death, the recovery of stolen relics, disposing plague-ravaged corpses and even the very sanctity of history itself (not to mention the BBC's coverage of it) are playfully mocked, deflated of pomp via slapstick, skewered with wordplay and broadly parodied through excessive violence and overturning clichés, earning some of the biggest laughs in cinema and permanently ensuring the reputation of British comedy. The script deserves a great deal of credit. It's among the most quotable works in the English language and gains points for style, variety and dexterity, but it's the pacing that keeps it together: as soon as it fires off a verbal volley or a silly sight-gag it's already nimbly charging into the next scene. It hardly matters if not every scene works for every viewer (the experimental animation sequences and an anachronistic police investigation are often cited as weak points), but with such abundance, breadth and depth of humor it remains a genuine pleasure even after many viewings.